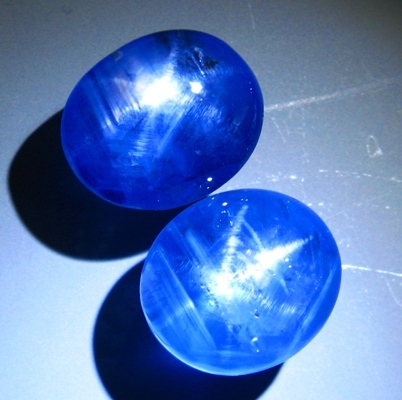 Comment: Here is a pair of significant blue star sapphires. Each gem on its own is a rarity, as matching pair this is a miracle. We do not know of any comparable offer on the web, neither past nor present. Both gems come with an exquisite fine Ceylon blue in tone MD70 and 75, one star (11.94) is simply perfect, the other one (12.33) is pretty close to perfect. Face up the two gems barely deviate in size (less than a half millimeter). See big images since stars are immensely difficult to capture, two even more so (especially without edit and paste per photoshop). 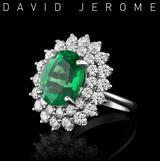 Some images focus on one gem and others, in the same setting, focus the beam on the other gem. Mark that both gems actually stand upright without help, that is how symmetric and centered they are (most stars in this shape roll over). Mark also, that they both have zero belly on the back but stand up high and slim. Such opulence of course does not come cheap. 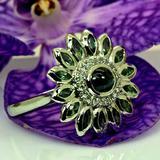 If you have tried to find truly cornflower blue star sapphires you know they are remarkably hard to find.